We can predict severe weather in Missouri, but not the type of damage it brings. Following a severe storm, your first roofing concern is whether or not the storm has caused any leakage that might damage your home or business’ interior. Even if your roof has survived a storm without leaking, there may be significant hail damage you might be unaware of. This is why it’s important to call an experienced roofing expert to check your roof for any signs of storm damage. How do I know if I had hail or wind damage to my roof? Can I tell from the ground? If you have had hail in your area, we can only determine if the shingles have been damaged by close inspection of the shingles. This inspection must be made from the rooftop and must be done by a professional trained in hail damage assessment. If you have wind damage, you may see shingles on the ground or shingles missing from your roof, but not all damage is visible from the ground. I was on my roof and it looks fine. Could there still be damage? Hail and wind damage is subtle in nature and may not physically cause leakage for years after the storm. Some would say that granular loss does not necessarily constitute damage to the asphalt shingles themselves. Others would say that the shingles are designed to lose granules, which is partly true. However, shingles that suffer accelerated granular loss due to hail and wind storms are decreasing in product life and performance. Granular loss that exposes the asphalt mat of a shingle constitutes damage. When hail hits a shingle, it looks like a “bruise” or a dark spot where the granules on the shingle have been knocked off, possibly causing the asphalt underlayment and sometimes the fiberglass mat to be exposed. When you have continuous hail damage, it will leave a shiny appearance because the asphalt has been freshly exposed and has not had time to weather to a dull color. My gutters and siding were damaged in a storm. Does your company handle gutters and siding repairs? Yes, we are a full-service repair company. 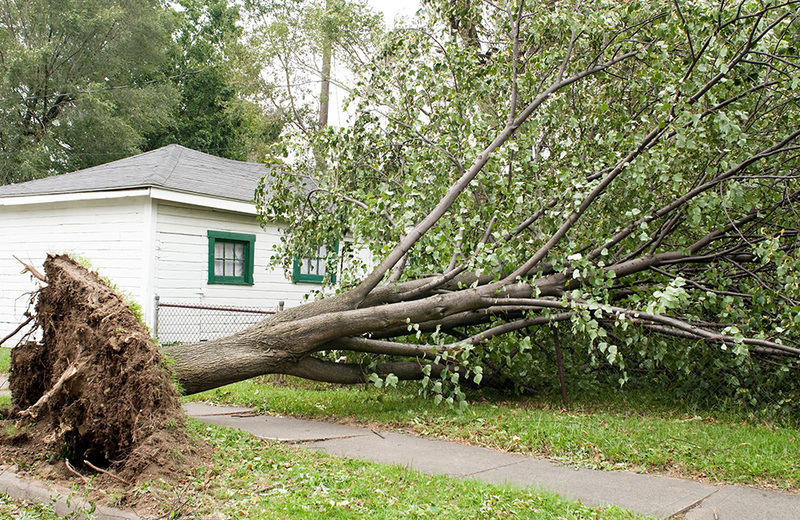 We can cover any issues you have that are storm-related, including damage done to the interior of your home. If your home or business has suffered damage due to severe weather conditions in St. Louis, MO or the surrounding area, don’t panic! Act fast before the damage worsens and contact Edward's Roofing & Exteriors today!